The game of football, including its name, is one of great contention throughout the world. So many different sports claim the name despite being almost nothing alike, save for the use of some sort of inflated leather ball. Most people associate the name with the world’s most beloved game that Americans call soccer. Americans have their own game called football, which bears no resemblance to its namesakes. The Australians, not to be left out, have their own homegrown version. And rugby football is yet another popular iteration that clutters the field. If you’ve been around fans of these games you’re familiar with the arguments about which are tougher, or require more skill to play, not to mention the level of athletic prowess displayed by those who play them. 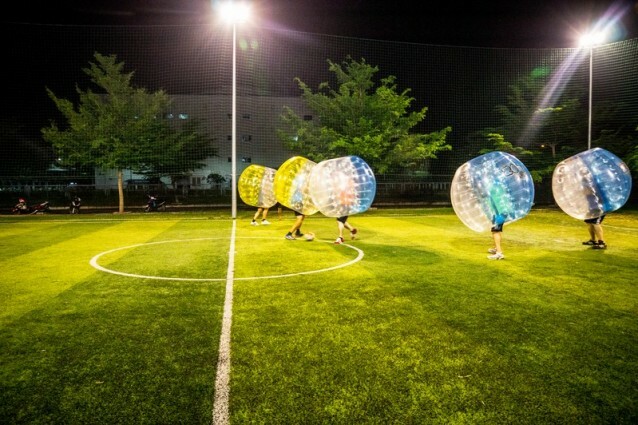 Enter zorb soccer, or zorb football, if you will. Invented by a couple of Norwegian television show hosts, it resembles the beautiful game in that it features a round, paneled ball and the objective to put it into a goal, but that’s where the similarities with soccer end. The game takes on the feel of the world’s other versions in that players are allowed, even encouraged, to hit their opponents with as much force and violence as one can muster. 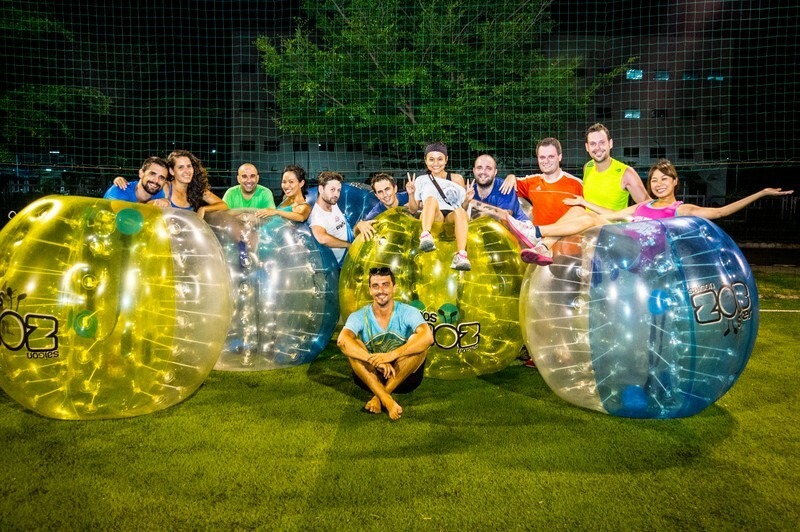 It sounds dangerous until donning the inflatable orbs that distinguish zorb soccer from anything else. At 1.5m in diameter, and approximately 10kg in weight, the adjustable orbs cover participants from the waist to well over the head. Players can use the orbs to deflect passes and shots as well as running into opposing players to knock them down and disrupt them. Taking the pitch, our group started out rather tentatively as knocking people down during a game of soccer, especially your friends, is counter-intuitive. The first game was highly experimental. Contact was more akin to playful nudging while we attempted to control the ball, pass and shoot. After a few solid hits, however, innate competitive juices, and the desire to smash people, were overwhelming. The game morphed from putting the ball in the net to hitting people as hard as we could. Indulging one’s violent nature with laughter and camaraderie as the by- products is among the most fulfilling activities in which civilized human beings can hope to partake. Flying around the field with reckless abandon seeking not the opportunity to score a goal, but to lay one of your mates out like a cheap rug is both thrilling and a joy. Zorb soccer not only allows people to entertain more base instincts in a fun and friendly environment, it also levels the playing field. 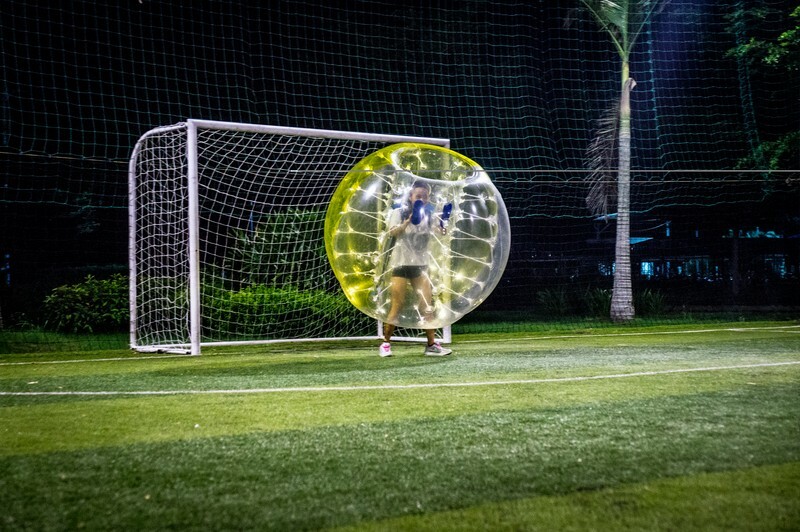 Those who are good at the game of soccer won’t find those skills necessarily translating to zorb. Where these people are used to running circles around those without the skill, experience, or training to compete with them, they now face opponents whose mission is more that of a guided missile than defender. On the other end of the spectrum, the more stoutly built of us who normally can’t keep up a rigorous pace will find that they are the immovable objects and the irresistible forces. So long as no one blindsides them that is. Fred, the most stoutly built person in our crew swept up and down the pitch with the force of a tsunami, leveling everyone in his path. In one instance, a player who I shall not name to spare him the embarrassment, delayed choosing sides in one game in order to make sure he was on Fred’s team. There is almost as much satisfaction watching someone launching a player off their feet, sailing through the air and landing with a thud as there is in laying that person out yourself. I said almost, because delivering a bone-jarring collision is what zorb soccer is about. The game is sure to catch on here. France has some 40 clubs devoted to it and there are more than 30 active leagues in the US already. Lacour plans to open a space in Thao Dien for the game and will deliver to other locations should a group wish to book their own event. The latter will include a delivery fee in addition to the rate of VND150,000 per person per hour.